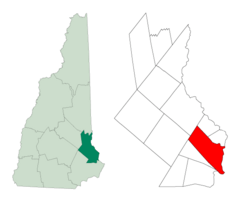 Dover is a city in Strafford County, New Hampshire, in the United States of America. The population was 29,987 at the 2010 census, the largest in the New Hampshire Seacoast region. The population was estimated at 30,880 in 2015. It is the county seat of Strafford County, and home to Wentworth-Douglass Hospital, the Woodman Institute Museum, and the Children's Museum of New Hampshire. The first known European to explore the region was Martin Pring from Bristol, England, in 1603. In 1623, William and Edward Hilton settled Cochecho Plantation, adopting its Abenaki name, making Dover the oldest permanent settlement in New Hampshire, and seventh in the United States. One of the colony's four original townships, it then included Durham, Madbury, Newington, Lee, Somersworth and Rollinsford. The Hiltons' name survives at Hilton Park on Dover Point (which was originally known as Hilton Point), where the brothers settled near the confluence of the Bellamy and Piscataqua rivers. They were fishmongers sent from London by The Company of Laconia to establish a colony and fishery on the Piscataqua. In 1631, however, it contained only three houses. William Hilton built a salt works on the property (salt-making was the principal industry in his hometown of Northwich, England). He also served as Deputy to the General Court (the colonial legislature). In 1633, Cochecho Plantation was bought by a group of English Puritans who planned to settle in New England, including Viscount Saye and Sele, Baron Brooke and John Pym. They promoted colonization in America, and that year Hilton's Point received numerous immigrants, many from Bristol. They renamed the settlement Bristol. Atop the nearby hill they built a meetinghouse surrounded by an entrenchment, with a jail nearby. The town was called Dover in 1637 by the new governor, Reverend George Burdett. It was possibly named after Robert Dover, an English lawyer who resisted Puritanism. With the 1639 arrival of Thomas Larkham, however, it was renamed after Northam in Devon, where he had been preacher. But Lord Saye and Sele's group lost interest in their settlements, both here and at Saybrook, Connecticut, when their plan to establish a hereditary aristocracy in the colonies met disfavor in New England. Consequently, the plantation was sold in 1641 to Massachusetts and again named Dover. On June 28, 1689, Dover suffered a devastating attack by Indians. It was revenge for an incident on September 7, 1676, when 400 braves were duped by Major Richard Waldron into performing a "mock battle" near Cochecho Falls. After discharging their weapons, the braves were captured. Half were sent to Massachusetts for predations committed during King Philip's War, then either hung or sold into slavery. Local braves deemed innocent were released, but considered the deception a dishonorable breach of hospitality. Thirteen years passed. When colonists thought the episode forgotten, they struck. Fifty-two colonists, a quarter of the population, were either captured or slain. During Father Rale's War, in August and September 1723, there were Indian raids on Saco, Maine and Dover, New Hampshire. The following year Dover was raided again and Elizabeth Hanson wrote her captivity narrative. 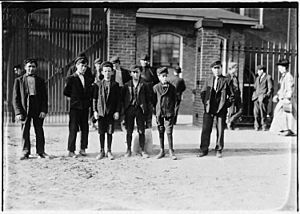 Child laborers at Cocheco Manufacturing Company in 1909, photo by Lewis Hine. Located at the head of navigation, Cochecho Falls brought the Industrial Revolution to 19th-century Dover in a big way. The Dover Cotton Factory was incorporated in 1812, then enlarged in 1823 to become the Dover Manufacturing Company. In 1827, the Cocheco Manufacturing Company was founded (the misspelling a clerical error at incorporation), which in 1829 purchased the Dover Manufacturing Company. Expansive brick mills, linked by railroad, were constructed downtown. Incorporated as a city in 1855, Dover for a time became a leading national producer of textiles. 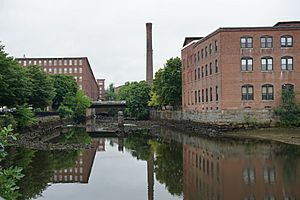 The mills were purchased in 1909 by the Pacific Mills of Lawrence, Massachusetts, which closed the printery in 1913 but continued spinning and weaving. During the Great Depression, however, textile mills no longer dependent on New England water power began moving to southern states in search of cheaper operating conditions, or simply went out of business. Dover's millyard shut in 1937, then was bought at auction in 1940 by the city itself for $54,000. There were no other bids. Now called the Cocheco Falls Millworks, its tenants include technology and government services companies, plus a restaurant. According to the United States Census Bureau, the city has a total area of 29.0 square miles (75.2 km2), of which 26.7 square miles (69.2 km2) is land and 2.3 square miles (6.0 km2) is water, comprising 7.96% of the city. Dover is drained by the Cochecho and Bellamy rivers. Long Hill, elevation greater than 300 feet (91 m) above sea level and located 3 miles (4.8 km) northwest of the city center, is the highest point in Dover. Garrison Hill, elevation approximately 290 ft (88 m), is a prominent hill rising directly above the center city, with a park and lookout tower on top. Dover lies fully within the Piscataqua River (Coastal) watershed. The city is crossed by New Hampshire Route 4, New Hampshire Route 9, New Hampshire Route 16 (the Spaulding Turnpike), New Hampshire Route 16B, New Hampshire Route 108, and New Hampshire Route 155. It is bordered by the town of Newington to the south (across the inlet to Great Bay), Madbury to the southwest, Barrington and Rochester to the northwest, Somersworth and Rollinsford to the northeast. South Berwick, Maine, lies to the northeast, across the tidal Salmon Falls River, and Eliot, Maine, is to the east, across the Piscataqua River. The Cooperative Alliance for Seacoast Transportation (COAST) operates a publicly funded bus network in Dover and surrounding communities in New Hampshire and Maine. C&J Trailways is a private intercity bus carrier connecting Dover with other coastal New Hampshire and Massachusetts cities, including Boston. Wildcat Transit, operated by the University of New Hampshire, provides bus service to Durham, which is free for students and $1.50 for the public. Amtrak's Downeaster train service stops at the Dover Transportation Center with service to the Portland Transportation Center and Boston's North Station. As of the census of 2010, there were 29,987 people, 12,827 households, and 7,059 families residing in the city. The city grew by 3,103 residents between 2000 and 2010, the largest numeric growth of any town or city in New Hampshire. The population density in 2010 was 1,123.1 people per square mile (433.3/km²). There were 13,685 housing units at an average density of 512.5 per square mile (197.8/km²). The racial makeup of the city was 90.6% White, 1.7% African American, 0.20% Native American, 4.6% Asian, 0.05% Pacific Islander, 0.6% some other race, and 2.3% from two or more races. Hispanic or Latino of any race were 2.2% of the population. There were 12,827 households, out of which 27.8% had children under the age of 18 living with them, 40.8% were headed by married couples living together, 10.3% had a female householder with no husband present, and 45.0% were non-families. 31.8% of all households were made up of individuals, and 9.6% were someone living alone who was 65 years of age or older. The average household size was 2.27, and the average family size was 2.89. In the city, the population was spread out with 20.3% under the age of 18, 11.0% from 18 to 24, 30.6% from 25 to 44, 24.9% from 45 to 64, and 13.1% who were 65 years of age or older. The median age was 36.7 years. For every 100 females there were 96.0 males. For every 100 females age 18 and over, there were 94.0 males. For the period 2009–11, the estimated median annual income for a household in the city was $55,040, and the median income for a family was $69,980. Male full-time workers had a median income of $51,891 versus $36,167 for females. The per capita income for the city was $30,590. About 6.8% of families and 8.9% of the population were below the poverty line, including 13.2% of those under age 18 and 5.9% of those age 65 or over. Dover was used as the fictional setting for the Hallmark Channel movie Christmas Incorporated. Dover, New Hampshire Facts for Kids. Kiddle Encyclopedia.